As if it weren’t magnificent enough that this rich, satiny avocado chocolate pudding recipe comes together in less than 10 minutes and tastes terrific, it’s a little mind-boggling to learn that it’s also dairy-free, gluten-free, paleo-friendly, and vegan. Shall we go on? Actually, we will go on…to make this recipe again and again and again. We’re tempted to try swapping the cocoa for melted chocolate to create an even richer mouthfeel and more indulgent taste sensation, though of course that’d be the end of the dairy-free, paleo-friendly, and vegan perks to this recipe. Oh well. 1. Using a spoon, scoop the avocados from the peel and plop them in a blender or food processor. [Editor’s Note: If you own a Vitamix, this would be a swell time to use it.] Add the coconut milk, cocoa powder, honey or maple syrup, vanilla extract, coffee powder, and sea salt and process until completely smooth, scraping down the sides of the bowl as needed. You want to keep processing until there are no little green blobs of avocado. This will probably take about 2 minutes. Taste and, if desired, add more honey or maple syrup and process again to combine. If desired, press the pudding through a fine-mesh strainer. 3. Stir the pudding and serve. Excellent! This avocado chocolate pudding recipe was so quick and easy with very few ingredients. It should be noted that the avocados must be very ripe, or they will not process into a smooth purée. I used a food processor to prepare the pudding, and it worked very well, as long as it was scraped down periodically. Very silky smooth. My husband, who usually turns his nose at these "alternative" types of recipes, LOVED it. He recognized the avocado taste, which is present but not overpowering. This is, by far, the best version of avocado chocolate pudding we have tried. And we have tried many, many versions. When we first read about it, we didn't quite believe it could work, but it does, and we are now experts because we have tried so many variations. We think that the coconut milk and the coffee are the special ingredients that make this recipe superior. We use the best quality vanilla, our favorite sea salt, and perfectly ripe avocados—if the avocados are not perfectly ripe, then the texture of the pudding is not quite smooth. If the avocados are a day too ripe, then the pudding doesn't fluff up as beautifully. And you must blend the pudding fully until it is absolutely smooth because green bits in chocolate is not proper. This pudding comes together in just a few minutes. We’ve served it plain, with cacao nibs, whipped regular cream, whipped coconut cream, coconut sprinkles, and berries, all to great success. We often eat it for breakfast. If you add several tablespoons fine coconut sprinkles and stir, the pudding has a fun, crunchy, bumpy texture! We always use full-fat coconut milk and maple syrup. We plan to make this pudding to use as a frosting on a special birthday cake with fresh raspberries soon. We love this recipe! This is a pretty darn good vegan chocolate pudding recipe. It’s rich, not overly sweet, and the coffee granules make it suitable for grown-ups. (The avocado makes it a high-fiber dessert, too!) Using my hand-held immersion blender, I took no time to whiz everything in a bowl. The pudding was silky and creamy—no avocado lumps. I think you can “kinda sorta” detect the avocado only if you know the avocado is in the pudding, and therefore you scrutinize each spoonful with superbly alert senses. I put a small portion of the pudding in a lidded glass jar and refrigerated it for 24 hours and loved the result. (Also, no skin formed on the surface of the pudding.) Bye bye, plastic wrap (and saucepan)! For kids, I would skip the coffee and increase the amount of honey or maple syrup. I’ve been searching for a lactose-free chocolate pudding recipe for friends, and this was heavenly. The avocado added thickness and texture and was truly barely noticeable. It blended smoothly in the food processor, which I ran for about 2 minutes until the entire mixture was smooth. I placed the pudding in a dish with a lid and stuck it in the fridge and during the evening I pulled it out over and over again to dig a spoon in. Finally, unable to resist any longer, I dumped a helping over some bananas. It was heavenly. As an aside, my husband thinks the cocoa is a little strong, so if you have a not-so-sweet tooth in your home, I think you could cut the cocoa down a little. 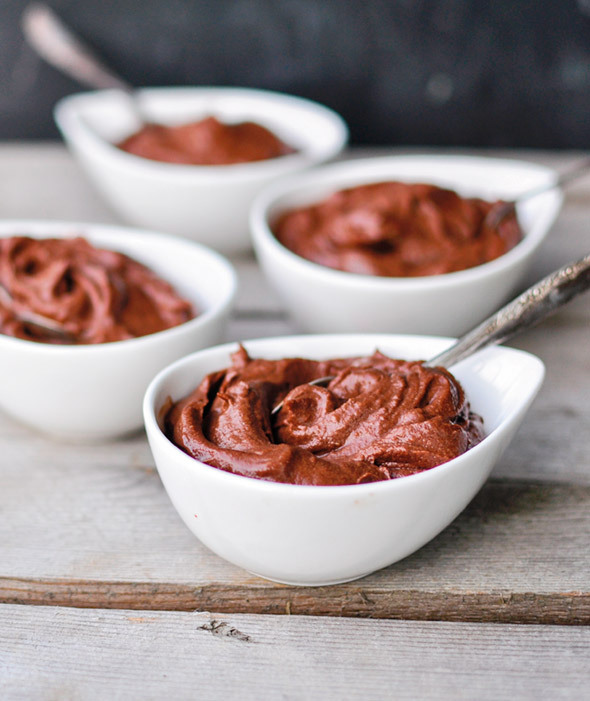 This avocado chocolate pudding recipe was a total surprise for me. Not only is it quick and easy, but it really does produce a pudding-like quality. First, I processed the avocado alone. This worked very well as I was able to see any unprocessed parts of avocado, scrape the bowl, and continue to process until smooth. Then I added the coconut milk. Once the coconut milk was incorporated, I added the rest of the ingredients. This entire process took about 10 minutes, including the time it took to peel, pit, and cube the avocado into the processor bowl. I placed the pudding in the fridge for 2 hours. My batch produced a scant 4 cups, however that may be due to the size of avocados I used. Mine were small and ripe. Using larger avocados may yield a little more pudding. While I did taste a hint of avocado and coconut milk, it did not detract from the overall flavor. I thought it was quite delightful. Be forewarned, though, that not everyone will love it. This thick and creamy avocado chocolate pudding came together in less than 10 minutes. I blended all the ingredients in my Vitamix blender, and there wasn't a green lump in sight...just thick, very rich pudding. The initial taste of the pudding was rich and chocolatey with a wonderful mouthfeel. I could detect avocado in the aftertaste somewhere on the roof of my mouth. If I make this again, I might add a bit more instant coffee or perhaps some liqueur of some type to mask the avocado flavor just a bit more. I served the pudding with some toasted coconut and raw cacao nibs. Personally, I enjoyed the extra texture. It would probably be nice with some whipped coconut cream (or whipped regular cream) as well. I can imagine it as a filling for a chocolate cream pie. The pudding lasted for several days in the fridge and did not change in texture. It actually tasted better on the second day (and it was good on day three, too). I stored the pudding in a metal bowl with a lid. No skin formed on the pudding. This recipe for avocado chocolate pudding sounded repulsive, so naturally I decided to make it right away. Avocado is not a fruit I’d ever considered putting in a dessert, but darn it if it didn’t make for one of the silkiest—and easiest to put together—puddings I’ve ever had. It’s a great alternative for folks who are lactose-intolerant, and I appreciated not having to heat and thicken the mixture as with standard puddings or custards. That said, my tester and I both discerned a moderate avocado-y finish with each bite, thus I can’t agree with the author’s assertion that the taste is undetectable. (I’m curious whether people could identify the taste if not told beforehand that avocados are used.) I’d make this again, but next time use less avocado and a bit more coconut milk. Also, as I tend to find a lot of desserts too sweet, I initially added just shy of 1/3 cup sweetener, but it needed more to balance out the bitter notes from the cocoa and coffee and the lingering avocado. (I used espresso powder instead of instant coffee—not sure if that made for extra bitterness.) I put in another couple tablespoons sweetener but would add even more in the future. It puréed very well with my very ripe avocados—no green blobs. (I blended it for a while though. Maybe 2 minutes.) Finally, I ended up refrigerating the pudding overnight and found it to be perfectly thick and much smoother in terms of bitterness than when I tasted it initially. Oh boy! My son loves pudding and he really loved this avocado chocolate pudding recipe. No artificial flavors, no preservatives, and it's good for him?! Win, win! Plus it comes together in mere minutes. We even gobbled some up before it had a chance to chill. I used a Vitamix to blend everything, as I have a feeling a regular blender would leave gobs of avocado. If you only have an everyday blender, I'd recommend pressing the pudding through a fine-mesh sieve prior to chilling. 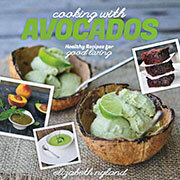 Avocado Chocolate Pudding Recipe © 2014 Elizabeth Nyland. Photo © 2014 Elizabeth Nyland. All rights reserved. All recipes and photos used with permission of the publisher. Hi, love the recipe. I did switch the maple syrup with half of very ripe banana. Came out fantastic. Wonderful, Tina. Love the banana substitution.